Trained healthcare was a distant dream when Sukili was pregnant for the first time. Tragedy struck and she lost the baby. But ten years on she benefitted from Nepal’s free maternal healthcare programme and had a healthy baby girl. 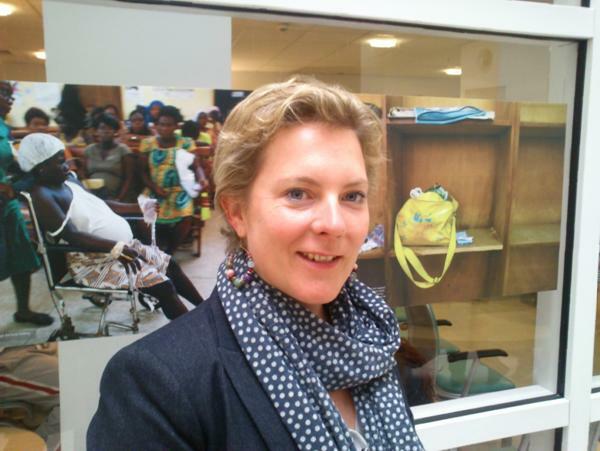 Ceri, a policy adviser, spoke at the launch of the Oxfam Birth Rights exhibition at Kings College Hospital in London. The exhibition champions the rights of pregnant women around the world and celebrates the successes of the free maternal healthcare programme in Ghana in a series of photographs of two mothers who arrive at hospital to give birth. Photo: Mina Abossan (middle) and Vida Boye, of the Ghana Nurses Association, with Oxfam worker Ceri Averill (right). Oxfam has worked with the Governments in Nepal, Ghana and Sierra Leone on changing healthcare policy to give pregnant women free pre and postnatal care. There is still more work to do. One Oxfam project in Nepal is making sure women have the information they need. Challenges include recruiting and training doctors, nurses and midwives in rural areas. In Nepal, the Government has introduced an incentive where working two years in a rural area prioritises you for further training. Ceri heard some heart-breaking stories during her trip. When one woman went into labour, the ambulance was ready, but the family couldn’t afford to pay. Eight hours later when the family had collected enough money, the woman had died. The husband had sold part of his land to pay for the ambulance and was left to look after the surviving twins. Another woman was carried to the hospital by villagers who walked for hours to get her there. “We need to bring these situations to the attention of the decision makers,” she said. Mum of three Milly, who blogs as South of the River Mum, was shocked to hear that even when maternal healthcare is free women still have to buy disinfectant, a hairnet and bring their own bed sheets. Photo: Milly Hutchinson aka blogger South of the River Mum. 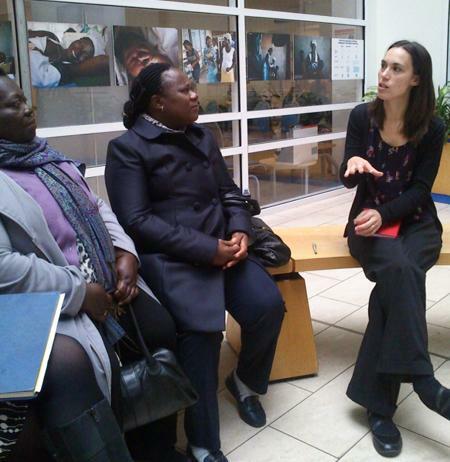 The hospital runs an exchange programme called Health Partners to research and improve healthcare around the world. 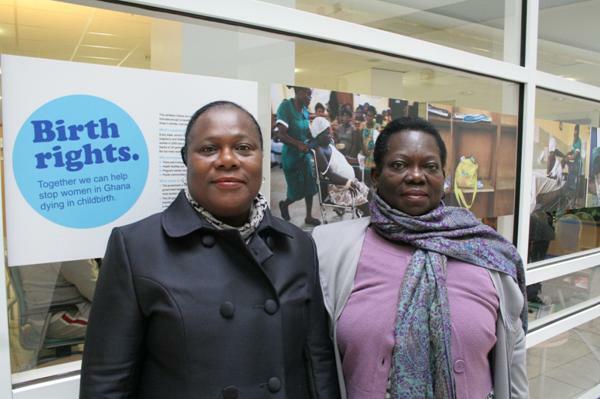 Photo: Vida Boye and Mina Buafoha of the Ghana Nurses Association, who support the campaign. Again she sees the main needs as transportation, more trained health professionals and education for mothers before, during and after the pregnancy. She said many people in rural areas rely on traditional birthing assistants. For more information and to fill out an online petition to pressure the Government to stick to its promise on international aid, visit www.oxfam.org.uk/birthrights. Contact laitkenread@oxfam.org.uk to host the exhibition which is made up of 22 pictures and comes with a DVD, petition cards and booklet.